I think I can I think I can I think I can! I'm chugging on through some projects! 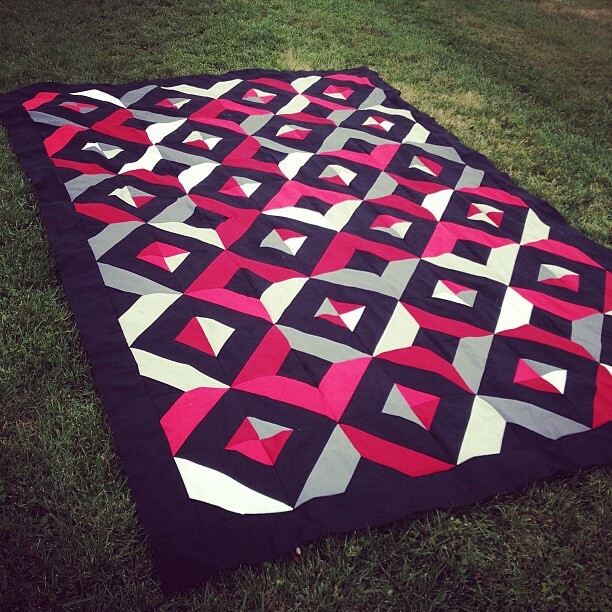 I finished my Modern Maples quilt! 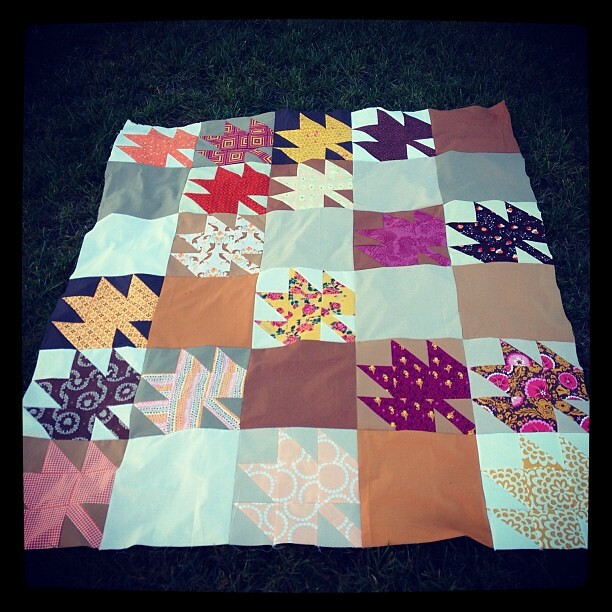 I'm still a bit undecided on how to quilt this so it's been put aside for now. All ideas are welcome! This is my backing for my Modern Maples, but I don't have quite enough so I'm still brainstorming the best way to make it work! 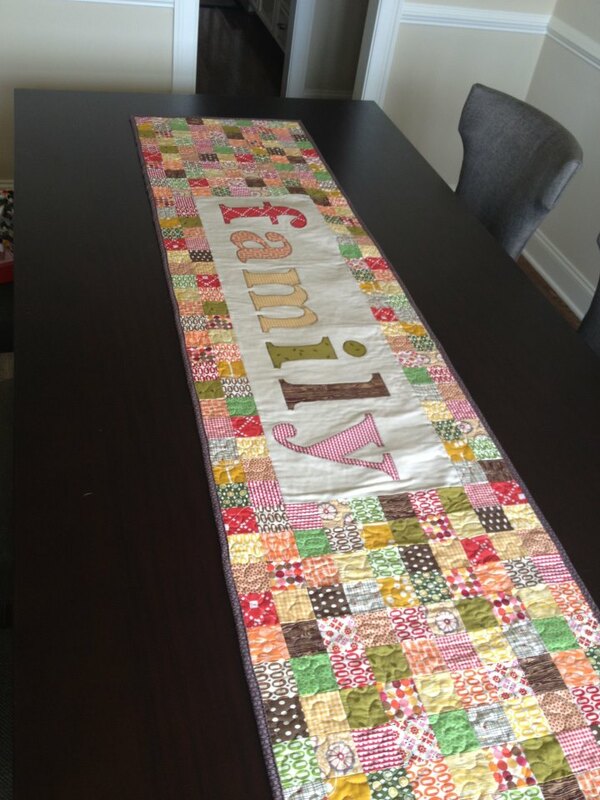 I also finished the custom order table runner. It's a larger version of a tutorial I have on my blog. This one is 20"x80". The font is from Word and is called Georgia. Heads up if you make one of these, it is spot clean or hand wash only! The center portion isn't quilted so it's gets a bit wonky if you wash and dry it like a normal quilt! I finished this custom quilt top too! It's been nick named "The Beast" since it is 108"x156"!!!! It's at a long arm quilter now because I was not going to even attempt to wrestle that! I also finished a few gifts for my best friend's baby shower! I won't be able to go (she lives in TX), so I may have gone a bit overboard with the gifts. 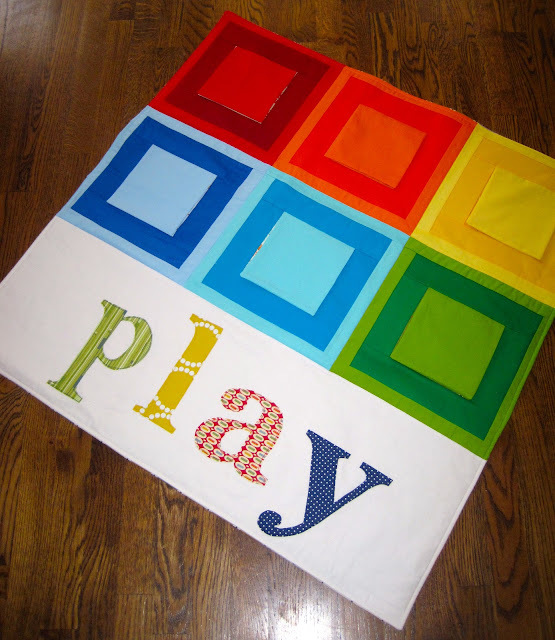 This is a peek-a-boo play mat based on Anna Maria Horner's pattern in Handmade Beginnings. I modified the original pattern by only making 6 blocks instead of 9. I did this for a few reasons: 1) I wanted to eliminate some of the girly colors since she's having a boy 2) I wanted to personalize it a bit by adding the applique 3) I really didn't have any cute I-spy type fabrics in other colors. Oh, I also didn't add the border that the pattern calls for. The mat is 36" square. Peek-a-boo! I used some precious fabric here (not that my bestie would know that), but it's for someone special so I needed special fabric. Had I to do this over again, I think I would have added some batting or at least some top-stitching to the flaps--just to make it feel more polished. I raw edge appliqued the letters in matching thread rather than blanket stitching to add even more texture after it's washed. I was especially happy to find a home for that squares fabric! 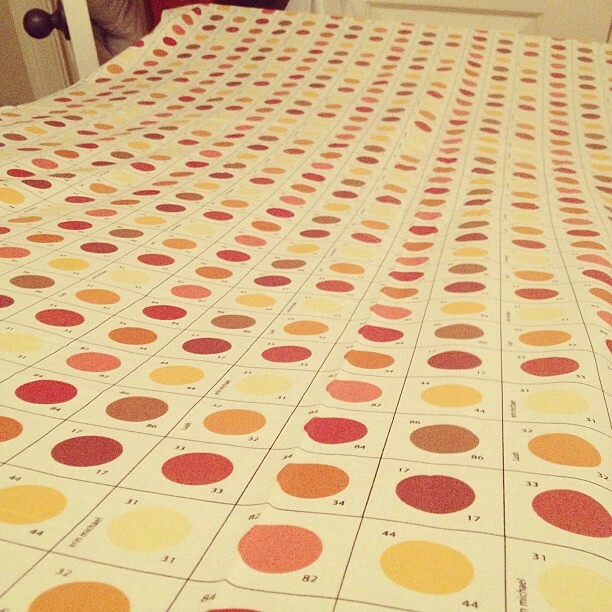 I was gifted that fabric by a friend and have always loved it, but I never had the right project for it. This was a match made in heaven! I also made a minky-backed monogram blanket, two appliqued onesies (Texas and the Apple logo), and three bibs! 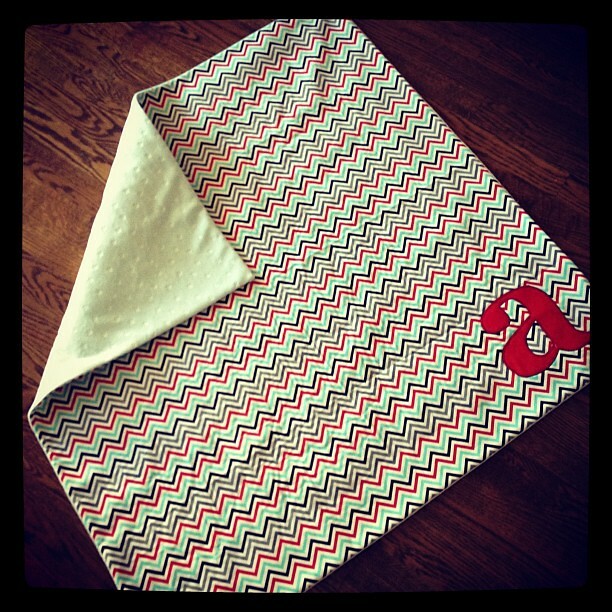 Here's a better pic of the monogram blanket. Whew! Off to work on some more projects!!!! Also, your modern maples is stunning, definitely one of the best I've seen. Get you on a roll Wonder Woman! Kinda jealous of your best friend! I just love that TX onesie. Lordy girl! When you mean productive you aren't kidding. And I even watched you make all those and I'm still shocked! lol I have that square fabric too and I'm still waiting for the perfect project. 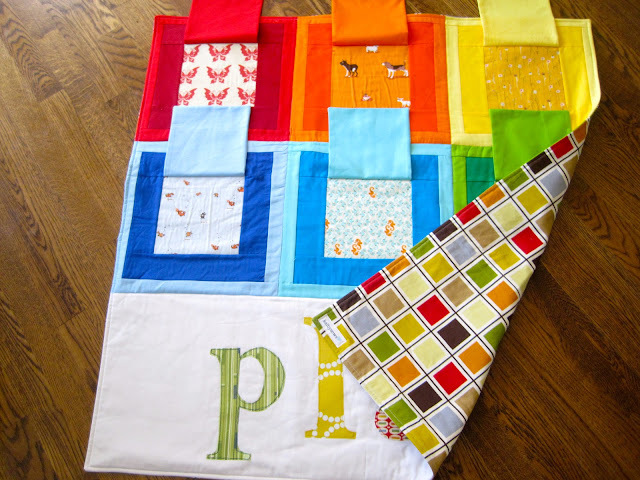 I often find that my fabrics that need a home find their homes in projects for kids and babies. i love your modern maples. love it with my whole hear! gorgeous! gosh, you HAVE been busy! did you give the beast to beverly or did you find someone else to do it? You can really knock some crafty goodness out!! I adore your modern maples top! LOVE IT!! I have to finish the hand binding on mine still- argh! LOVE the peek-a-boo blanket- you rock lady! Woohoo, some more knocked off your to-do list!! Love the baby gifts! Very Advising blog and i became a abounding fan of this blog due to its arresting and advising data. Coach, Circus, and Cranberry Pie!